First of all, it will need to introduce what is Makkala? Makkala is a type of traditional hand made hats used in Arakan. It is made up of bamboo and foliage of palm trees . It is used in Arakan by its own people since ancient time. Nowadays, Makkala is well-known for throughout Myanmar as of it was used as a symbol of the leading political party in Myanmar, National League for Democracy. The origin of this song is famous, ancient poem about buffalo-boy (not cow boy). In country sides of Myanmar, buffalos are used for farming as like cows. Some says that strength of buffalo is better than that of cows and productivity of the farming with buffalo too. After using them in farming, in their leisure hours, teenagers from the villages bring them to wander around the nearby mountains and dells to allow them to relax. There is a bell made up of wood hanged around the buffalo’s neck, it makes sounds as the buffalo moving, helping the buffalo boy to find out where are they if they got lost inside the forest near to small mountains. In my childhood days, I asked my dad what those things are hanging around the cows’ and buffalo's neck, my dad gave me a funny answer as a joke, he told me that is buffalo's radio, they were listening while they wandering around the forest. Buffalo herding song is derived from the buffalo teaming poem, and it was used as a poem in text books in high school in Myanmar once a few decades ago. Then, it was omitted in the updated text books already. 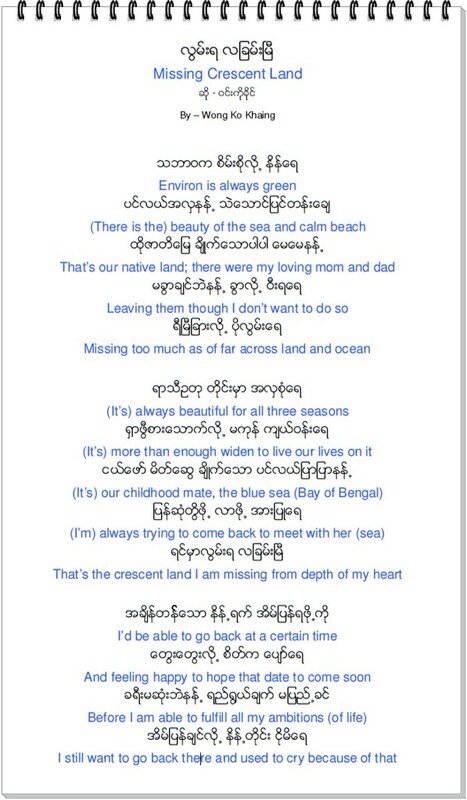 Now it was renewed as a song by famous Arakanese singer, Khaing Kyaw Lun. Here is the song of Buffalo Herding, I hope you should have fun by listening and watching MTV of it. One of the major difficulties that most of Myanmar people coming abroad and looking for job (like myself) has to face is job interview. Though English language is the second official written language, but it is not common language spoken in Myanmar (formerly known as Burma). Therefore, the first thing while we reach abroad and face the interviewer who speaks English language, there is a big difficulty in communication for us (it doesn't mean all, I mean most of the people like myself). Other than how to convince the interviewer by telling him what things we are able to do, the first thing we worried is that are we able to understand what he is talking about? And second thing is that is he able to understand what I am trying to answer? These two things are the major obstacles that we usually had to pass through. There are a lot of friends who are capable of working skillfully in their specialized category of jobs, lack of communication skills and faced such kind of difficulties and sometime fail to get a job within stays granted by respective immigrations of countries, eventually have to go back to Burma. So, for those who are still striving to get job in this time or those who are trying to change better career in their lives, I would like to share one of the Audio book that will help you to go through the second item of our difficulties. How to convince the interviewer by telling what you can do, and what are you going to add value to their organizations if you get employed in it. Do you have convincing answers ready for these important questions? Landing a good job is a competitive process and often the final decision is based on your performance at the interview. By following the advice of prominent career planning and human resources expert Peter Veruki, you'll know you have the right answers at your job interview. Peter Veruki has been Director of Career Planning and Placement at the Owen Graduate School of Management at Vanderbilt University for ten years. In addition to serving on the College Placement Council Board of Governors for six years, Mr. Veruki was chairman of the CPC's professional Training and Development Committee, where he helped design and conduct interview training programs. We, Myanmar Brewery Ltd, leading beer brands like Tiger Beer, Myanmar Beer, ABC stout, Anchor Beer and Myanmar Double Strong Beer is urgently looking for ACCOUNT OFFICER in finance department and MECHANIC in admin department. Please find the attached files for information details. If you are interested or have someone who is expertise is accounting filed or vehicle repair and maintenance, please send application with following necessary documents to one of our address or email. Please be aware that the closing date of this vacancy is 30.9.10 (Thursday). We would appreciate if you could share this to everyone as much as you can. The details requirements are described in attached documents. Please download the attachment for details. You should be the one who is suitable for the post or you can even forward to somebody who is looking for similar jobs. As we have been abroad and staying for long time, initially we hoped that as longer as we stay there, lesser and lesser we would be missing our home land. But, actually it was totally wrong. We all human being, even though we migrated from one place to another for certain unavoidable reasons of life, the place we called home town or native land, we would be missing it for whole life. For Arakanese, it is more obvious than other races I have known on the world. 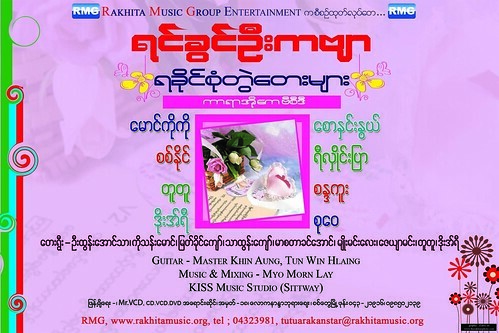 Today, I would like to feature one of the Arakanese songs sung by Arakanese Singer, Wong Ko Khaing. It’s about missing the crescent land. 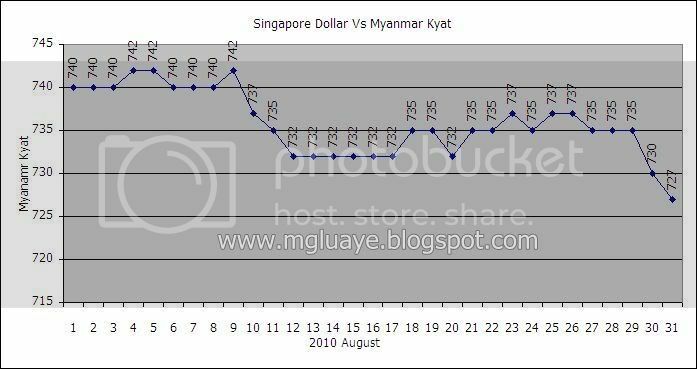 For the month of August 2010, the average exchange rate between SGD and Myanmar Kyat was 735.8065 Ks/SGD (11.2903 up from previous month average rate), highest was 742 Ks/SGD on 4th, 5th and 9th of August and fell lowest until 727 Ks/ SGD on 31st of August. 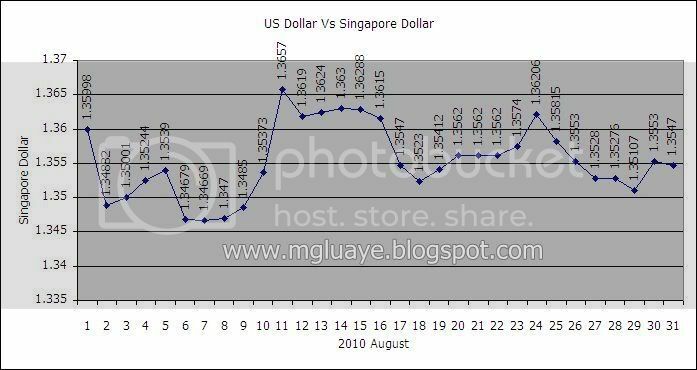 For USD vs SGD, the average rate for the month of August was 1.3553 SGD/USD (0.0214 down from previous month average rate), highest 1.3657 on 11th of August and lowest 1.3467 on 7th of August. I'd like to say sorry about that survey on the customers' satisfication of Myanmar Restaurant results was coming out quite late. We had received all together 22 entries of our visitors' views on this survey. Yanant Thit got 7 votes and win the first place in the listing. Mya Nandar got 6 votes and win the second place in the listing. Inle got 3 votes and the third place in the listing. Oriental House and Win Myanmar got 2 votes and stood fourth place in the listing. 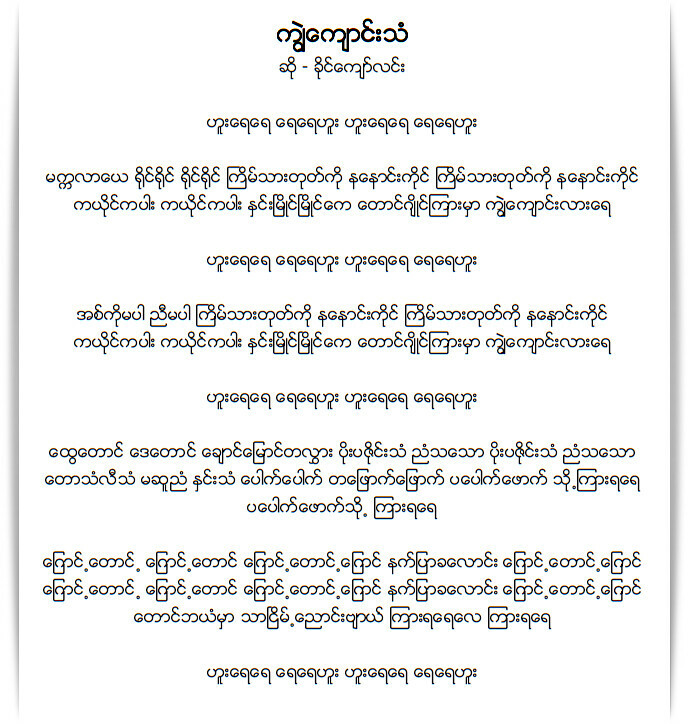 Shwe War Myay and Zeyar got 1 vote each and stood fifth place in the listing. As of this is first time survey, we cannot said that the results are 100% accurate. We will be running one more time survey by coming December 2010. We hope that the upcoming survey will come out more accurate figure for the Myanmar food stalls. Anyway, we appreciated all of our friends' opinions and contribution.